Once upon a time there was a folk dance group that required its female dancers to wear a dirdnl’ish costume with a corset over a cotton blouse and sometimes real, sometimes fake, carnations stuffed down the front of said corset. This effectively rendered the girls dancing flower pots. Boy dancers were encouraged to ‘smell’ the carnations while the girl dancers twirled coquettishly from one to the other. When they weren’t sniffing carnations, the boys danced ‘figure’ dances, pretending to chop wood or other acts of physical prowess meant to attract the hapless flower pots. I was a member of such a folk dance group. For the record, it wasn’t my idea to join. I was fourteen and shy and my parents thought it would be just the ticket to bring me out of my shell. I suppose in a way it did. It was also where I learned to drink beer. And it’s where I met Laura, from whom I received the recipe mentioned in the title. Laura wisely left both the dance group and town at the first opportunity, stuffing everything she owned into a small car and driving west until she got to Calgary. A few years later I followed. Not to Calgary, but to Edmonton. Close enough. Only 300 km away, it made Alberta a place where I knew someone. We’d visit each other on occasional weekends, mostly me going to her place, the main floor of a big old ramshackle house with no yard but access to a back stoop, room enough for a Hibachi. The kitchen smelled of meatloaf, coffee and Joy dishwashing liquid. Laura was the first person I knew (my age) who not only liked to cook but talked about food, grew herbs on windowsills, owned actual cookbooks and shopped for food with all kinds of serious enthusiasm. Even more amazingly to me, almost ten out ten times she preferred inviting people to her place for a meal over meeting at a restaurant. She was interesting in different ways (she once moved into an apartment with a bright red fridge and spaghetti on the ceiling; beyond enviable when the rest of us were still living in bungalows) but this cooking thing struck me as a little over-the-top… remember, this was eons ago, when food as a ‘thing’ hadn’t been invented yet. When only five people in the whole world read Gourmet. In that ramshackle Calgary kitchen Laura served me my first Caesar salad, and I remember thinking it was pretty groovy that she made the dressing by throwing ingredients into a jar and shaking it like maracas. 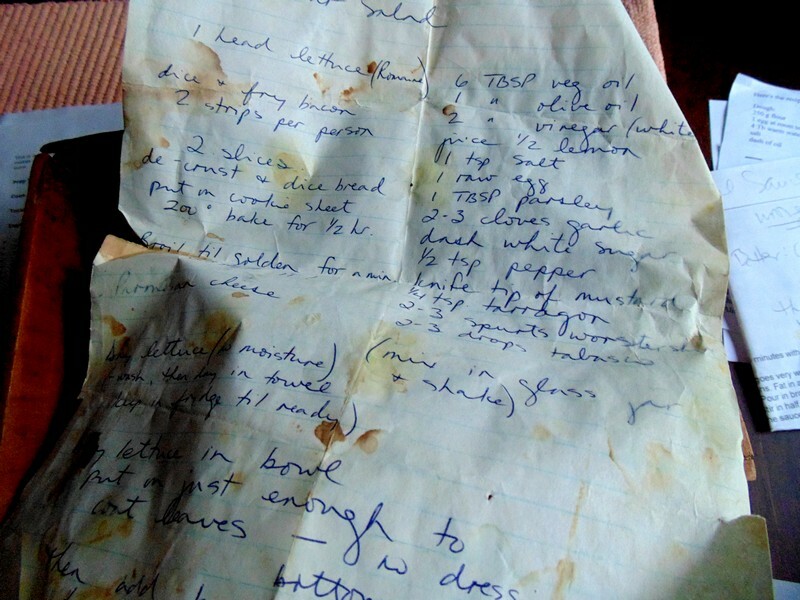 I came across the recipe recently—the original paper version I wrote out while she dictated precise instructuions all those decades ago. More than slightly splattered and used (though not for some time now as I’ve since discovered other recipes. Julia Child’s and Ina Garten’s, for two). But they don’t come with a story. As a thumbnail sketch an elder in my community threw me a bridal shower and arranged that all the guests would bring cue cards with their favorite recipe. Some handwrote. One made a wooden box to put them all in. My aunt gave me a couple recipes of my grandmother’s cakes, who had died over 50 years before. I made her Queen Elizabeth Cake for my hubby to be and it took him straight back to his childhood and his grandmother who died years before. A recipe can be a special gift sometimes. A) What a great idea to have people bring favourite recipes. B) How amazing to have both your grandmothers connected that way. Magical. Thank you for sharing this, Pearl. The night Dennis and I met we exchanged chocolate chip cookie recipes, so the writing was on the wall then that we might still be together 39 years and 11 months later .. And the Caesar salad recipe we use today is the one we “discovered” together (had never eaten the salad before) when he took me to his Science Formal at Queen’s and we ate dinner beforehand in the fairly new, and swanky, Olympic Sailing Centre built for the 1976 Olympics. Just a couple of kids playing grown-up in our glad rags and very impressed when the waiter wheeled a table over beside us and began preparing the salad right before our eyes in an over-sized wooden bowl. Somehow, in our already inebriated state, we managed to remember all the ingredients and his method until we could write down the recipe the next day, when we were somewhat sober. I’m not sure whether we still have that written recipe, because we both soon committed it to memory. The only problem is that we each make the salad in a slightly different way so that this has caused no end of argument these past three-or-so decades as to which one makes the better salad. Dennis has finally conceded though that mine does have the edge. Although he won’t go so far as to admit that I am indeed the better overall cook in this house. So are you saying that the dressing you use today is the one you put together from drunken memory at Queens??? I love that. Great story, Susan, and lovely memories. Thank you! Absolutely the same recipe … we think.